Planters Harvest Medley Mix is a mesmerizing combination of sweet and salty, featuring seven different snacks in one 16.75 oz. canister. A handful at breakfast, lunch or after dinner will give you a boost of energy and a delicious taste that will leave you craving more. This mix features peanuts, raisins, chocolate candy pieces, chocolate covered peanuts, almonds, cashews and cranberries that combine to create a unique flavor in every handful. 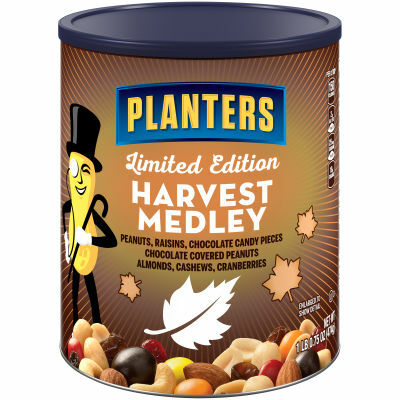 Planters Harvest Medley Mix is a limited edition item, so get it while you can.